Thank you to all who participated in our Freeze it Forward challenge! We are truly blessed and encouraged by how you care for those in your community! Keep serving, loving, and sharing, and we wish you fulfillment as you fill others. We wanted to share some testimonies from OAMM readers and staff who shared this week. Rebecca’s meal stash in the church freezer. I organize a group that meets once or twice a month to cook 6-10 freezer meals in a few hours. We have been meeting for several years now. We meet at my church and cook at least one set of each meal to leave in the freezer at church. We package them in servings for two to four people so it’s not a large amount of food for elderly people. Our church cooks a meal on Wednesday nights and will deliver to shut ins or people who call in meal requests. They often send a freezer meal with the delivery person so there is a hot meal that night and one to cook later that week. 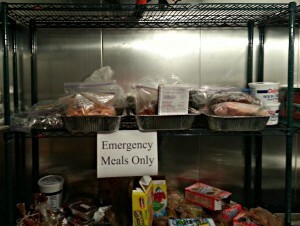 My group’s freezer meals have gone to people home from the hospital, new moms, shut-ins, and even people off the street who come in looking for food. My favorite story about who we helped was a young couple who had been taking care of a grandparent. She passed away and the whole family came into town for the funeral. The young couple didn’t have money or means to feed the extended family so they called the church looking for help. We were able to take several meals out of the freezer to them to help feed the family. Food is something we all need and it is great to be able to help people while cooking for my family. Rebecca was also able to share allergy-friendly meals with a family affected by a tornado last year that couldn’t eat the food from the Red Cross. Single servings for a shut-in widow. I brought several single portion meals to one of the widows in my church. She used to be at church for every event and had a smile for everyone. She always attended every bridal or baby shower and brought a thoughtful gift, but now she is shut-in and we don’t see her much. As she suffers from dementia, I brought one of her friends (another older woman in the church) with me because I wasn’t sure if she would recognize me. She was a little confused, but she was so happy to have a home-cooked meal and some company. I went hoping to bless her, but I was actually more blessed by observing the friendship between these two women. I only hope that I will have a friend who will care for me like that when age has taken its effect on me. This is not the kind of woman that you would describe as “sweet” or “touchy-feely,” but the love she has for her friend was palpable. She so happily served her friend, even though she has her own struggles. I now realize there is a lot I can learn from her about being a friend and a wife. I hope to deepen our relationship even though she is a quiet type and old enough to be my grandmother. I absolutely love learning from these older, wiser women. Today I dropped off a freezer meal to a foster family who just got a sibling set placement. 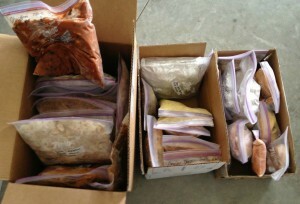 I also try to make a few extra freezer meals every month with the purpose of giving them away. It was really helpful last week when a different friend got a foster placement and another friend got sick. It’s nice to know that I can help since I already have meals frozen and don’t have to stress out my family to make it happen. 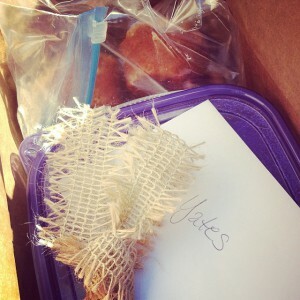 Lisa’s OAMM meals boxed up and ready to share. I love having extra meals in the freezer to bless others with. From the teacher during conferences week who barely has time to breathe, to the friend having surgery, to the mom working full time and taking night classes, to the pastor whose days are filled to the brim. It is almost a “double blessing” because I feel blessed in being able to help to bring families around the table for a hot and delicious meal. I have been doing this for years. I always make sure I have at least 2 or 3 extra meals in my freezer to give out as needed. Last week a friend was diagnosed with cancer and I was able to feed her family for the weekend while we worked on setting up her plan for the next several months during her treatments. Our mom’s group does a meal swap, donates meals to a family in need (Support Sisters), plus gives meals to new moms and their families. I did it yesterday. I gave my neighbors dinner so they would have a nice meal after working in the yard all day. It is THAT simple folks! Just be a good neighbor. I started a small group at church, Cooking With Purpose. We got together once a week to prep freezer meals. We each kept 2 meals. One to feed our family and one to give to someone in need or to just help out. It is so simple to give a meal if you just plan a little when making your own dinner once a week!